Bangkok has recently been voted “Best City of the World” for the second year in a row by the TRAVEL+LEISURE magazine. One of the reasons why Bangkok is such a great place is the abundance of great food. And in Bangkok, some of the best foods is not what you find in restaurants, but it’s the street food. Small vendors who sell from their food stalls for about $1 a meal. Pretty much everywhere you can find great street food in Bangkok – although not every street food stall is great. It’s great, because when you are on a Bangkok sightseeing tour, you can always grab a bite here and there. Chinatown is no doubt one of the most popular places for street food, particularly in the evening hours when it all turns into a huge food bazaar. Some vendors here have been selling their meals for decades already and are established institutions in the neighbourhood – others come and go. Sometimes street food stalls make it into a popular travel guidebook series and get such an influx of tourists that they get an offer they can’t refuse, sell their stall to someone else who then will milk the publicity for what it’s worth, raise the prices and serve mediocre food. So it’s good if you explore Bangkok’s street food with a local who can show you where it’s delicious and where not. In general it’s good advice to look where the locals go to eat and eat there too. The more people the better. But even that advice is not always true. For example, around the Silom area you will see lots of food stalls where locals are waiting in line for a bowl of soup. GREAT FIND, right? Well, no, not necessarily. Around Silom, for some reason there are hardly any good vendors – most serve dull dishes. But since there are so many office buildings around there, people gotta eat somewhere – and so they do. I have no idea why that’s the case – maybe they have to pay so much money to the land owners there that they can’t afford to use quality ingredients and make good food. Many people are worried about hygiene when it comes to street food – but oftentimes, the food here is a lot cleaner than the food that you get in restaurants in the USA or Europe, where you can’t see what’s happening in the kitchen. Food stalls are pretty much “out in the open”, and while there are exceptions (like the old lady selling noodles near Bayoke sky tower who washes her vegetables in the Khlong Saen Saeb* canal), the food is usually very clean and hygienic. 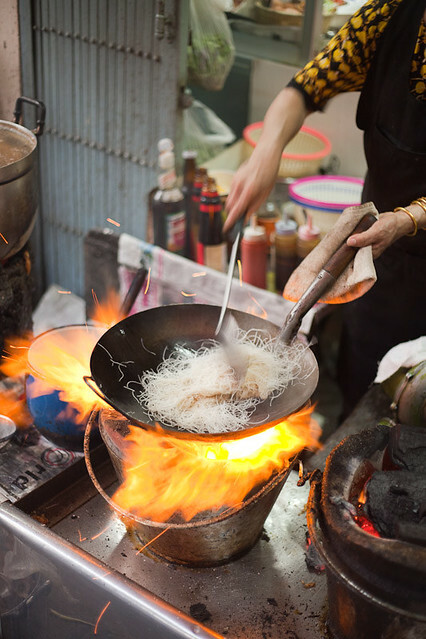 But particularly in residential areas where normally tourists don’t go you can often find some of the best eats – this is where normal Thai people live, and they care a lot about eating. The vendors here often live in the same neighbourhood, and friends and family come to eat at their stalls too. *scientists are arguing whether it’s actually water that is flowing in this canal, or whether the grey-blackish liquid substance has already been transformed into something else through some chemical reaction caused by industrial waste, garbage and sewage that’s thrown into this canal. There are tons of clean street food around town, you just got to look for cleanliness and safety which ain’t hard to pick up over time. I agree that some residential areas where no tourists go have some of the best traditional Thai food there 😛 There’s this very very good Kao Mun Gai and Som Tum food in front of my road. Thanks for your comment. 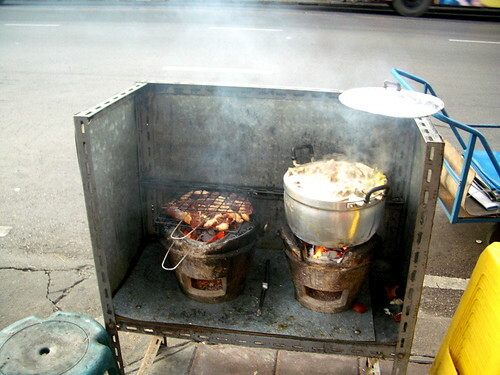 I agree, most streetfood stalls are clean, and the ones that are not are usually easy to spot.